A 6.1 magnitude earthquake hit Japan’s Osaka and surrounding regions early Monday morning, killing three and leaving more than 200 injured. This earthquake was followed by several other tremors on the same day in Osaka, ranging in magnitude between 2-3.5. About 110,000 homes were cut off from gas pipelines and northern Osaka has also been hit by water outages, reported Japan’s public broadcaster NHK. The quake collapsed building walls, roads, and set off building fires. None of the tremors were reported a tsunami risk and no nearby nuclear plants were affected. Some train services have been suspended for safety purposes, and nearby airports closed. Electronic and car factories halted production at their plants for the time being. According to NHK, 700 people have fled to evacuation centres. Associate professor of geodetics at Kyoto University, Takuya Nishimura, speculated on the cause of the quake. “It might be an aftershock resulting from distorted geological formations caused by the 1995 quake,” he told Kyodo news. 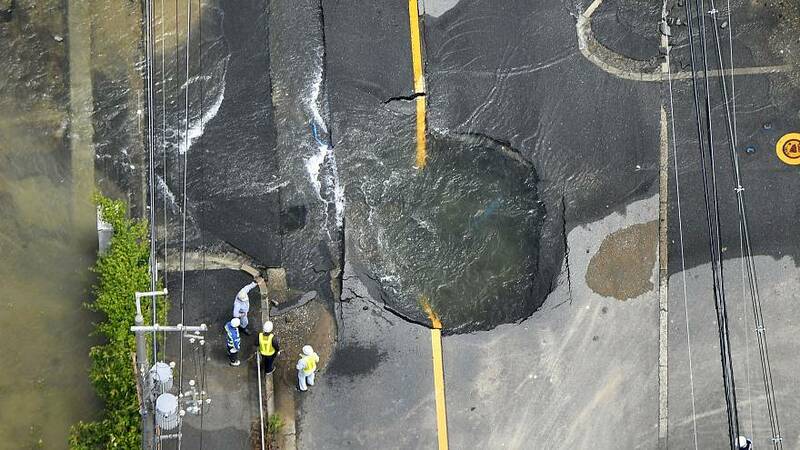 Other experts suspect a fault running under Osaka from north to the south may be responsible for the quake. Shinji Toda, a professor of earthquake geology at Tohoku University, said experts have long-regarded this fault as dangerous because it has been inactive for more than 10,000 years. Japan lies along the coast of the “Ring of Fire,” one of the most tectonically-active places on earth. In the basin of the Pacific Ocean, the Ring of Fire is a string of volcanoes and sites of seismic activity.